Charter a private flight to Saint-Barthélemy, an overseas collectivity of France in the West Indies, often abbreviated as St-Barth in French, and St. Barths or St. Barts in English. Charter flights to St. Barts are the fastest, most convenient way to travel – commercial airliners can’t use the island’s single, small airport. Travelers flying commercial have to stop at another Caribbean airport, and connect to another flight to continue to St. Barth, complete with baggage checks, security lines, conflicting schedules and all of the other issues associated with commercial air travel. Instead, arrange your charter flight with Air Charter Advisors, a Wyvern-certified broker offering simple, pay-as-you-go charter service with all-inclusive, upfront pricing – no long-term contracts, no hidden charges and zero membership fees. The number one priority of our company is the safety and comfort of our passengers. When arranging your charter flight with ACA, you’ll have a partner ready to advise and arrange all the details of your upcoming flights. Our friendly, highly-customizable service will be available to you all hours – a true 24/7, no matter what time zone you’re in. We’re one of a select number of Wyvern-certified brokers around the world, and we utilize Wyvern’s safety and auditing systems to review operator history, aircraft maintenance and pilot experience for every flight. Enjoy the peace of mind you get from working with a jet charter broker you can trust, and let Air Charter Advisors become your aviation solution for luxury air travel, aircraft acquisition and private jet management in the Caribbean. Luxury ground transportation, private helicopter & yacht charters, in-flight catering, Wi-Fi, plush interiors and more are available upon request. Give us a call at 1-888-987-5387 or e-mail us to receive a free charter quote and book your luxury private flight to St Barts. Enjoy all-inclusive, efficient, and transparent air charter service when arranging your private flight to Saint-Barthélemy with Air Charter Advisors. Our brokers go the extra nautical mile to offer clients the most competitive rates possible, whether you’re looking for efficient, enjoyable or extravagant. 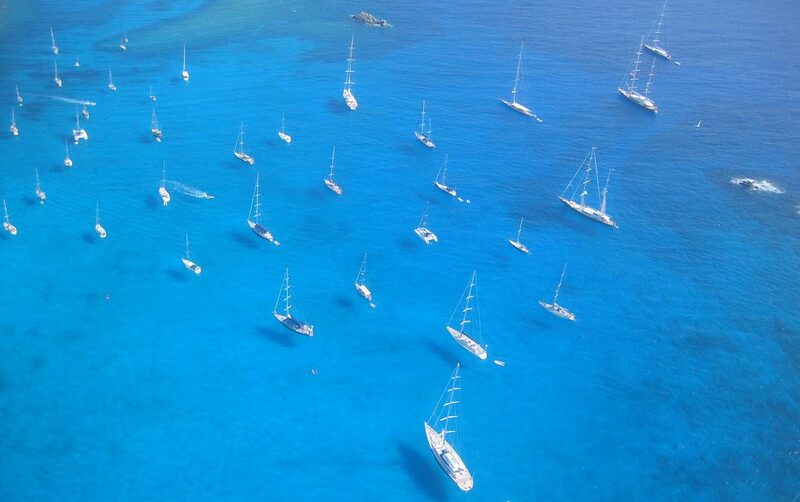 We can also handle any maritime arrangements for clients interested in chartering a luxury yacht or catamaran. A valid passport is required for U.S., Canadian, Brazilian, and EU National citizens. A visa is required if you plan to stay for more than 90 days. Proof of onward transportation is necessary. Your passport’s expiration date must be at least 90 days after your arrival date. For more information on U.S. passports, visit http://travel.state.gov/passport/passport_1738.html. Australia, Bermuda, Bolivia, Brunei, Bulgaria, Chile, Costa Rica, Croatia, Cyprus, Czech Republic, Ecuador, El Salvador, Estonia, Guatemala, Honduras, Hungary, Japan, Latvia, Lithuania, Malaysia, Malta, Mexico, Nicaragua, New Zealand, Panama, Paraguay, Poland, Romania, St. Lucia, Singapore, Slovakia, Slovenia, South Korea, Uruguay, and Venezuela. Citizens of Dominica, Saint Lucia, Bermuda, British Virgin Islands, Montserrat, Turks and Caicos Islands can visit visa-free for up to 15 days for each short visit, as long as the visa-free stays don’t total 120 days over a 12 month period. Visas are required for members of all other nationalities, including any staff traveling with you; you must also present proper documentation or you may be refused entry. Even if you previously cleared immigration without incident, proper documentation is necessary. St. Barts is home to some of the most extravagant, expensive five-star beach resorts you’ll find in the Caribbean. After you arrive at (TFFJ, SBH) Gustaf III Airport, we can arrange for luxury ground transportation to bring to your resort, or taking you to your preferred destination. Our team can also assist in chartering a luxury yacht or arranging a helicopter lift to help navigate your way around the Caribbean. Create the perfect complement to your luxury charter flight by checking out some of our top luxury hotel recommendations. Private charter flights are the most secure, comfortable and fastest way to reach St. Barts, but given the island’s diminutive stature, along with limitations at its airport, it’s not always a straight shot. Located on the northern shores of the island’s second largest city St. Jean, Gustaf III Airport (IATA: SBH, ICAO: TFFJ) is the island’s only airport and features a single, 2,133 foot concrete runway (10/28), which limits the type of aircraft that can arrive/depart at the airport; the airport mainly focuses on small regional commercial aircraft and charter service, with aircraft usually carrying less than 20 passengers. Air Charter Advisors can arrange for your private jet to arrive at St. Maarten, St. Kitts, San Juan or Anguilla, with a turboprop such as a Cessna Grand Caravan, Pilatus PC12, or Britton Norman Islander standing by to quickly transport you directly to St. Barts’ (TFFJ, SBH) Gustaf III Airport. 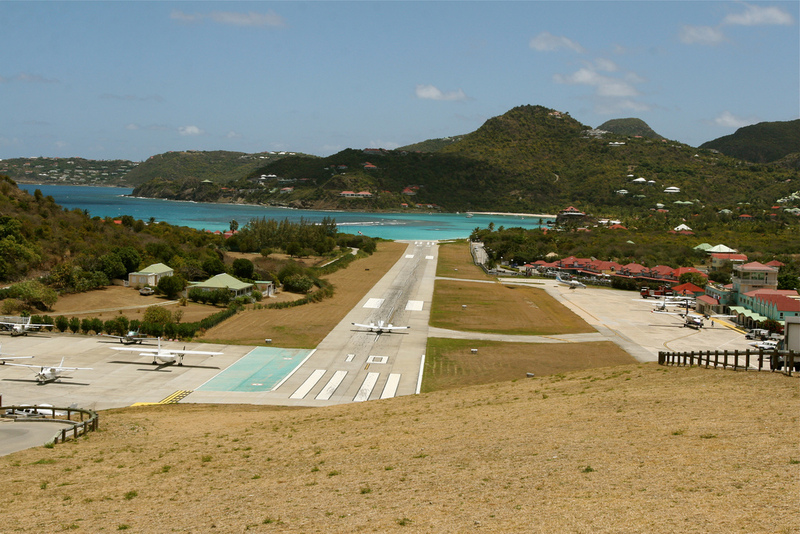 Both the airport and the island’s main city Gustavia are named for King Gustav III of Sweden, and the airport is sometimes referred to as Saint Barthélemy Airport or St. Jean Airport. The runway is located at the base of a slope ending directly on the beach; arrivals descend rapidly over a steep, hilltop traffic circle and departures fly directly over local sunbathers. 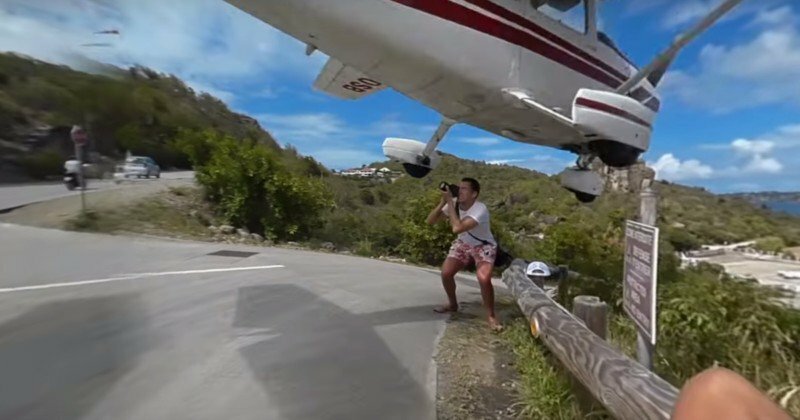 The History Channel ranked (SBH) St. Barts Airport as the third most dangerous airport in the world, and the photo above showing a tourist barely avoiding an approaching Cessna 172 highlights the close confines of the airport and local traffic. Request a Quote or give us a call at 1-888-987-5387 to speak with one of our St. Barts jet charter brokers to arrange your next charter flight to (TFFJ, SBH) Saint Barthélemy Gustaf III Airport.